In May 2006 we were told, with the most alarming language possible, that humans were causing the planet to warm with their use of Carbon based fuels. We must follow all of the recommendations of the IPCC report coming out in 2007 or humanity’s existence on earth would end. We were told that we must do something now, in order to prevent the deaths of untold millions, and the loss of humanity’s very ability to survive on earth. 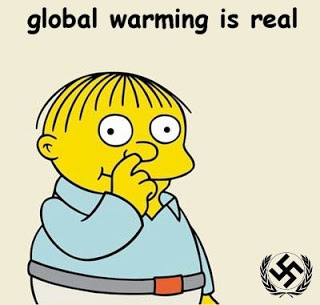 We must start taxing “Global warming Gasses” in order to stop their production, no matter the human cost! It’s a complete lie. The IPCC – the International Panel on Climate Change is a committee with an agenda, and one it was pre-programmed to execute. It was designed from the outset, from its very beginnings to come up with a specific result. This is in direct contradiction to every principle of real science, the aim of which is to describe reality as it is, not reality as one wishes it to be. To illustrate this, in 1995 the IPCC completely ignored Satellite evidence, very clear evidence, that there was no warming according to a report from the Heartland Institute Released in 2008. The full pdf. is titled Nature, Not Human Activity, Rules the Climate The institute claims, and is backed by anecdotal reports that the IPCC changed portions of the text of its report to make it appear that humans were the cause of the warming they artificially detected, or in other words, manufactured. Also attributed to the Heartland Institute’s report, the IPCC ignored further data confirming the lack of warming – if not showing a slight cooling – that became available after the May 2006 deadline. The report the column speaks of is the NIPCC. The Nongovernmental International Panel on Climate Change. A completely independent examination of all the evidence available in published peer-reviewed literature. They included every single piece or evidence available to them, positive and negative, they did not select research that proved their predetermined result as the IPCC did. They went through everything. Their conclusion, there is no human caused global warming. For anyone who has any sort of intellectual honesty at all, the report from the Heartland Institute is a MUST read. Dr. Fred S. Singer who conceived and directed the NIPCC project is an honored and decorated scientist. His Raison d’être is truth, not political machinations, or power. He is deeply concerned by the absolute mis-use of science in what has now become a multi-billion dollar business, that is based on what amounts to a hoax. This group of scientists, who have looked at all available evidence, from satellite to very unreliable ground temperature readings to historical records, concludes correctly; if Human governments are going to be institution policies that will drastically affect the lives of its citizens, and the Waxman-Markley Cap and trade energy bill is without a doubt just that, then it must be utterly certain of the science that backs the supporting reasons for the existence of the legislation. This report states unequivocally that there is zero evidence of man-made global warming. We are about to kill a Nation, literally for hot air that does not exist. But wait, there more: In an article titled Proved: there is No Climate Crisis written by Robert Ferguson July 15th 2008, he reports on mathematical proof “that there is no “climate crisis”. I say global warming is real. If you don't believe me, wait a few years and see how the world will be like: walking in landfills, drinking polluted water, and nature will be destroyed!